For the Absinthe Ritual you need to have an Absinthe Spoon. This is probably the most important accessory of the world of Absinthe! There are a lot of varieties of spoons on the market, therefore we will give you some help how to find the perfect spoon. An Absinthe spoon differs not only in its design, which is sort of a subjective decision, but also different materials are used for its production. The best material in our point of view is stainless steel. Because this material is durable and looks good. Our purchasing recommendation is the Classic Absinthe spoon or the Feuilles Absinthe spoon. Both are made of high quality polished stainless steel. 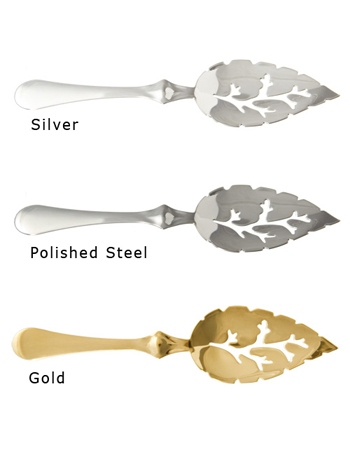 More expensive spoons are often made of brass, which is then plated with silver or gold. These spoons look good but need some care. Silver can tarnish, therefore you have to clean the spoon once in a while. A beautiful silver-plated spoon is the Paris 1889 spoon. It is a reproduction of the spoon, that was made for the inauguration of the Eiffel Tower in 1889. Below you find a list of spoons you can buy in our store. As we described in the paragraph above, you need an Absinthe spoon for the Absinthe ritual. A carafe / decanter or Absinthe fountain (if you are a professional) filled with ice cold water is needed as well. After filling the glass with 20ml Absinthe you use the carafe to dissolve the sugar cube with a thin beam of water. Once the water drips through the holes in the spoon into the Green Fairy the Absinthe changes its green color to milky white. We recommend a mixture of 1 part alcohol and 3 parts water, depending on the brand. Besides an Absinthe spoon you can also use an Absinthe Grille. An Absinthe Grille typically has three small arms. They give stability on the glass. The sugar cube is placed in the middle part. They are less frequently used, as they are less functional because you can not use them to stir your Absinthe. Nevertheless we like their design a lot and use them to add some variation to the Absinthe ritual. Famous visitors of the absinthe bar Moulin Rouge were Toulouse Lautrec, van Gogh or Manet. As Toulouse Lautrec was son of a very wealthy family, he possessed as well his very own spoon. And he always carried a ration of the Green Fairy with him: In his walking stick he had a reservoir for two shots. There exists as well nice story about Absinthe spoons which is connected with Hollywood. For the movie Dracula by Francis Ford Coppola a spoon was needed for a sequence where Winona Ryder tries the green elixir. Francis F. Coppola borrowed it from a private collector in France, as at that time, Absinthe was still prohibited in the USA and other countries of the world. He therefore used the original antique one from the collector. Nowadays of course you can get a lot of spoons online. Where can I buy Absinthe spoons online? Nowadays you can easily purchase your personal piece of history online. At ALANDIA we offer different designs for sale and produce as well our own line of spoons. These spoons stand out with their premium quality, therefore they are our recommendation to buy. We have a starter spoon in our selection, which is the Absinthe Spoon Classic. It is made of stainless steel and convinces with a very attractive price. The classic spoon is an authentic reproduction of a vintage original. More decorated and slightly more expensive is the Feuilles Absinthe spoon. It is as well a reproduction of an antique original. We like it a lot, as its design is more emotional than the Classic spoon. If you like the allure of nostalgia then we recommend to buy our Antique spoon. It is made by zinc die casting (not shiny stainless steel) to give it a vintage, slightly tarnished finish. A Grille is as well, part of the ALANDIA spoon collection. The one we produce is the Absinthe Grille Gothic. It is made of stainless steel and has an eye-catching trinity design. Besides a large selection of Absinthe spoons, you can buy of course as well real Absinthe, glasses, posters, fountains, carafes / decanter, sugar cubes and pipes at our store. On the following site "Absinthe for sale" you will find some more info about buying Absinthe online.